The "Tank Stream Fountain" commemorates the 150th anniversary of the first publication of the Sydney Herald newspaper. 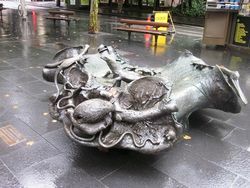 Designed by Stephen Walker, this four-part bronze fountain near Circular Quay incorporates dozens of sculptures of native Australian animals. Also known as "The Childrens Fountain" it is dedicated to all children who played around the Tank Stream. The Sydney Morning Herald began life as the weekly Sydney Herald on the 18th April 1831. It cost 7d, had just four pages and only 750 copies were printed. The paper, named after Scotland's Glasgow Herald, was founded by Englishmen Alfred Ward Stephens, Frederick Stokes and William McGarvie, who all worked for the Sydney Gazette. Note :- The settlement of Sydney was centred on a stream of fresh water that emptied into Sydney Cove. After the first few years the water was proving inadequate and the convicts were set to work digging holding tanks into its watercourse. Hence the first water supply was called "The Tank Stream." To commemorate the 150th Anniversary of the first publication of the Sydney Herald on April 18, 1831. The European settlement of Australia begins along its sandstone banks. Soon drought strikes and storage tanks are carved from the stone. Hence the name Tank Stream. The Tank Stream Fountain recalls mankind`s past dependence on this flowing stream and our links with life around the region.